up to 60% Off Stampin Up Close Out Sale! Stampin' Up! 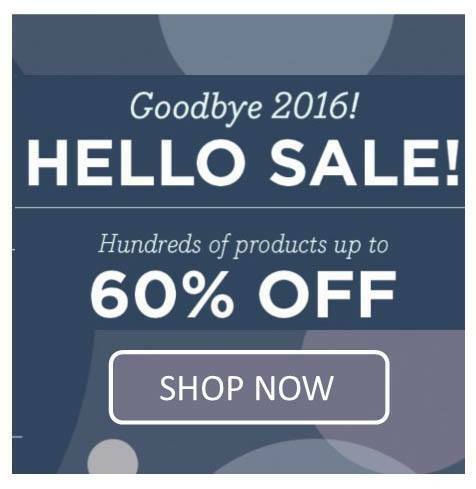 has been doing a little year-end cleaning, and we've got some great deals to offer you! Our Year-End Closeouts will include holiday retiring products, clearance rack items, and current high-inventory catalog products. There are 4 different SU promotions happening at once! Note: Retiring Holiday Products are listed in the Close Out but not all retiring holiday products are on sale. While Supplies Last! Hurry, when these are gone they won't be back. Note: Not all retiring products are on sale. Demonstrator Only: 2017 Occasions Catalog* Pre-Order begins today! Want Occasions Catalog products now? How about $26 Free? Get $125 worth of products, for only $99 AND free shipping on your kit. Include Occasions catalog pre-orders, Holiday Catalog and sale items. Plus discounts on all future Stampin Up products. Click here for details.